If you want to ship your boat and are looking for a reliable boat mover San Diego Auto Shipping is here. You will receive the highest level of customer service in the boat shipping industry when San Diego Auto Shipping moves your boat. San Diego Auto Shipping will always assure you complete confidence in all our abilities to safely move your boat or yacht to any location. It doesn’t matter how you want to move your boat, at San Diego Auto Shipping we can assist you with all aspects of your move. We will always collect all our necessary information about your vessel, from the year, make, model, and all dimensions such as length, height, beam, and weight. This way we coordinate with our driver making sure we select the correct trailer. If your vessel is over dimensional that’s NOT a problem. We are aware of all the permits and escorts to complete our task professionally, timely and safely. In addition, we transport sailboats as well as all power boats as well. So, feel free to fill out our quote on our website. We enjoy what we do and look forward to the chance to serve you! Why San Diego Auto Shipping? San Diego Auto Shipping is a reliable boat shipping company that has been handling various boat moving jobs for over 20 years. At San Diego Auto Shipping we have both professional staff and appropriate boat moving equipment to handle your job. Don’t hesitate to call us for your boat shipping across 50 states of the United States, including Alaska and Hawaii. 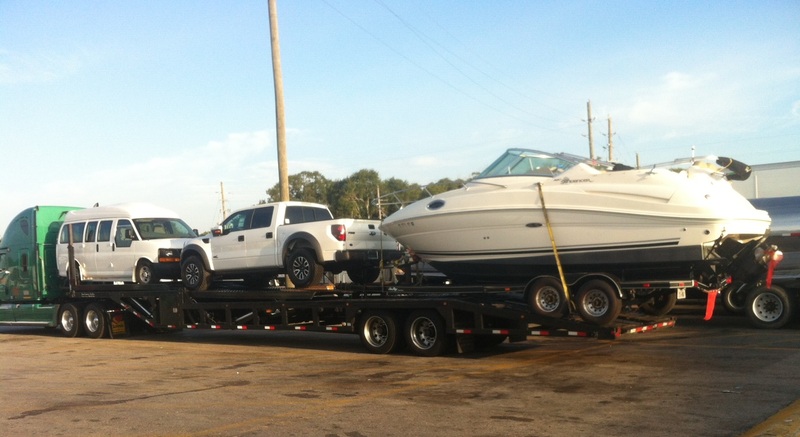 With San Diego Auto Shipping you can rest assured that your boat will be shipped in a way you want to see it. San Diego Auto Shipping is “the small company with the huge ability”. So, don’t hesitate to call us. You can also fill out our free quote. Our main goal is our customers’ satisfaction. Therefore, all our boat moving customers are pleased with the boat shipping service we provided them with. We are sure that you will be happy if you book a boat shipping service with us as well. You want to save your money. We want to keep our trucks loaded. Let’s do it together!